FILE - This combination of file photos shows U.S. President Donald Trump on March 28, 2017, in Washington, left, and Chinese President Xi Jinping, Feb. 22, 2017, in Beijing. President Donald Trump appears to be offering a grand bargain to Chinese President Xi Jinping in which each would get something he dearly wants -- an assurance of economic stability ahead of a critical Communist Party Congress in exchange for Chinese help in halting North Korea's nuclear programs. The second post was seen as a variation on the old ‘take it or leave it’ negotiating ploy. In a news conference Wednesday, Trump hailed the rapport he developed with Xi during last week's Florida summit. 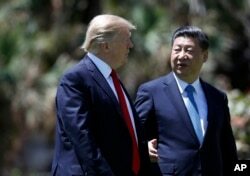 "I think he wants to help us with North Korea,'' Trump said of Xi, crediting China with taking a "big step'' by turning back boats loaded with coal that North Korea sells to its northern neighbor. North Korea conducts some 90 percent of its trade with China. In an interview with The Wall Street Journal, Trump was more specific in linking U.S.-China trade policies with cooperation on North Korea. The comments mark a start departure from Trump's pledges during the campaign to punish China for artificially devaluing its currency to gain an unfair trade advantage. Trump had promised to label Beijing a currency manipulator on his first day in office, a designation that could have ended with punitive tariffs and a potential trade war between the world's two largest economies. "They're not currency manipulators," Trump said flatly, adding that Beijing has not been manipulating its currency for months. Balbina Hwang, who served as a State Department special adviser on East Asian affairs in the George W. Bush administration, says Trump’s overture seems to be striking a nerve in Beijing. President Donald Trump and Chinese President Xi Jinping walk together after their meetings at Mar-a-Lago, April 7, 2017, in Palm Beach, Florida. A post-summit analysis in Hong Kong’s influential English language South China Morning Post argued that the real importance of the meeting for Xi was in building his portfolio ahead of the Communist Party congress, where he not only hopes to extend his term in office, but to cement his place in the pantheon of Chinese leaders. The article quoted political commentator Zhang Lifan as saying Xi’s target is to stabilize the Sino-U.S. relationship at all costs. “A trade war with the U.S. would affect the Chinese economy badly, and a military clash on the Korean peninsula would trigger a political crisis in China and put the leadership under challenge from inside the Party,” Zhang said. Trump’s diplomatic overture seems to have caught the Chinese leader’s attention. The U.S. president followed up Tuesday evening (Wednesday morning in China) with a phone call to discuss the latest developments on the Korean peninsula. Chinese state media reported that during the call, Xi called for “peaceful resolution of tensions over North Korea. 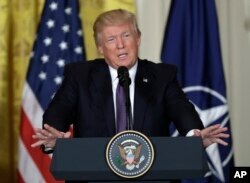 Charles Stevenson, acting associate director of the American Foreign Policy Program at the Johns Hopkins University School of Advanced International Studies, cautions that Trump’s very public negotiating strategy could backfire if he gets ahead of key U.S. allies in the region, South Korea and Japan. The latest Trump-Xi phone conversation comes as a U.S. aircraft carrier strike group heads to the waters off the Korean peninsula. “We are sending an armada. Very powerful,” Trump said Wednesday in an interview with Maria Bartiromo of the Fox Business Network. Pyongyang said Monday it would “hold the U.S. wholly accountable for the catastrophic consequences” after Trump dispatched the USS Carl Vinson and an accompanying battle group to the region.